On Monday morning January 14th, for the first time in 51 years, someone other than Paul J woke up the listeners of 670 KBOI. That someone was me, as a new era began with Kasper and Chris in the morning on KBOI. To say, I was a little nervous would be putting it mildly. I didn’t sleep much the night before my first show. I was worried that my alarm wouldn’t go off or that I would have anything substantive to talk about. Not only that, but KBOI was breaking in a brand new computer operating system. Now, it’s not as if this as my first rodeo, I’ve been working in radio since I was 18 years old, but this was different. I’ve never had to come in and be a part of an already established show…I’ve never been “the new guy”. Think back to the time you went to a new school for the first time ever. Remember how nervous you were to be in new surroundings….would you fit in? Would you like the person you sat next to? How would you be received and judged by everyone? Would I be able to find the lunch room? Well, that’s kind of what it felt like for me all over again, all except the lunch room part…I’ve never had a problem finding the lunch room. My first two weeks were a blur, with so much to do and things to get used to, but after my first 9 days on the new Kasper and Chris show, I can say that I was nervous for no reason. The listeners were awesome and welcomed me back to the radio with open arms. 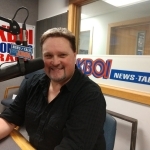 I received calls and emails from new listeners welcoming me to KBOI. I also heard from a few people who listened to me before at other stations, saying this was the first time they had ever listened to AM radio in their lives. Hey, welcome back to the future and thanks for making the switch with me. All my new co-workers in the building were great, and the two people I spend 5 hours with every morning, Chris Walton and Rick Worthington couldn’t have been better. They made my transition not only easy, but dare I say fun. Yes, radio is fun again. For the first time in my career, I get to discuss real topics that are important to our listeners and how they affect all of us. And I love that listeners get to call, email and text to interact with the show. Although I do have to say that waking up at 3:15 in the morning will take some getting used to. On a side note, I’d like to thank Paul J for retiring after 51 years and giving me this great opportunity. And I greatly appreciate that he took the time to personally introduce me to KBOI listeners. I don’t know if I’ll make it 51 years on KBOI like you did, but I’m gonna give it a hell of a try.